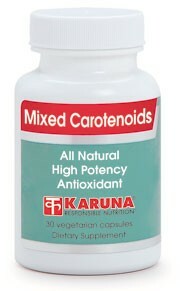 Mixed Carotenoids is a broad spectrum carotenoid supplement containing natural alpha- and beta-carotenes combined with lutein, lycopene, zeaxanthin and cryptoxanthin. All carotenoids have antioxidant activity, but their activities vary depending on which tissues they are deposited into preferentially. 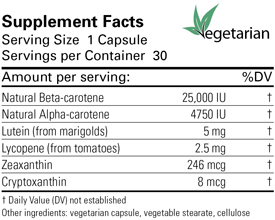 Mixed carotenoid supplements protect against imbalances caused by excessive intake of only one member of this diverse phytonutrient family. Recent large dietary studies have suggested that intake of several carotenoids is associated with more powerful protection for cellular health than is the intake of single members of the carotenoid family (Am J Epidemiol 2002;156:536-547; Cancer Epidemiol Biomarkers Prev 2000;9:357-365). Suggested use for adults: One capsule daily with meals, or as directed.